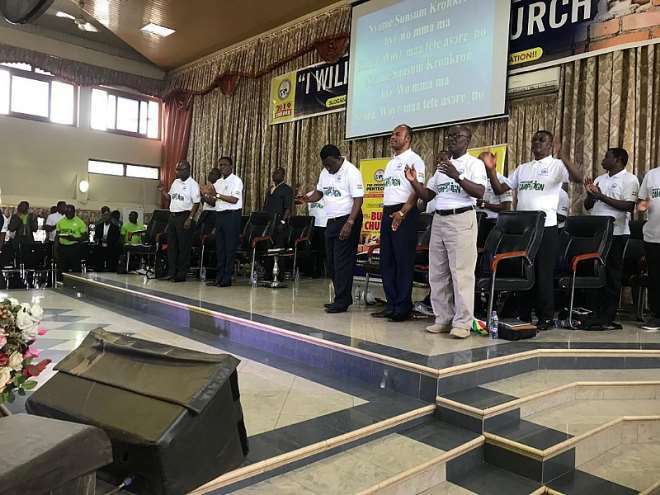 The Chairman of the Church of Pentecost (CoP), Apostle Eric Kwabena Nyamekye, has bemoaned the attitude of some sectors of Ghanaian leaders against the ways of God. Aps. 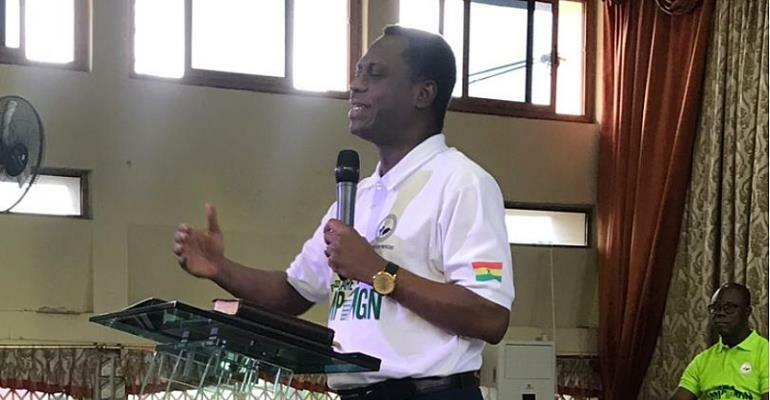 Nyamekye lamented about the attitude of some Ghanaian pastors who spent precious time preaching about their designer shoes and jackets they bought from western countries to show their wealth describing the act as shameful of religious leaders. He told the packed church which was also attended by chiefs that it was equally shameful for chiefs to sell one parcel of land to 10 people. He did not stop there, the revered man of God said it was shameful and despicable for our political leaders to go to Europe and others to borrow huge sums of money to build roads and social amenities for the citizens only to corrupt it for their personal benefits. The man of God said sometimes, we blame the politicians alone but many directors who are church leaders are peptrators of corruption. He lamented that about 70% of Ghanaians are believed to be Christians who believed in Christ yet corruption was on the ascendency which was indicative of the fact that the corrupt society was dominated by Christians and therefore called for a complete change of mindset to free the system of corruption and selfishness. Aps. 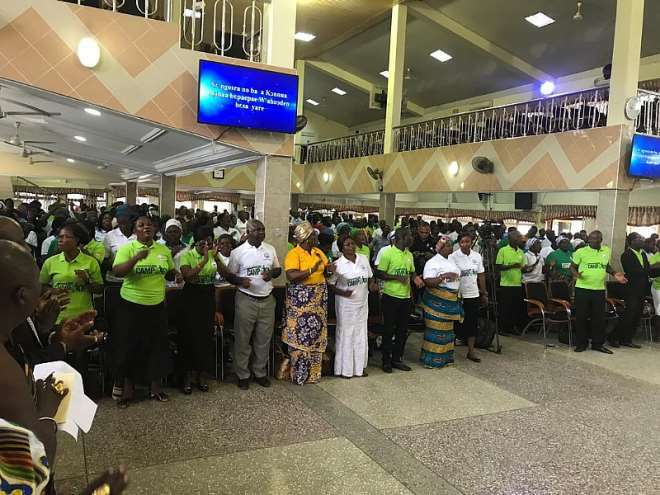 Nyamekye expressed his disgust when he addressed hundreds of member of his church, chiefs, and politicians at the Asokwa Area assembly in Kumasi during the church's launch of its Environmental Care Campaign programme in Kumasi. The campaign which was launched in Accra last year bears the slogan for the next five years as "My Environment My Responsibility". Aps. Nyamekye told the congregation that the church as part of its civic responsibility is in partnership with Zoomlion Ghana Limited to ensure that the environment is kept clean at all times while tree planting is incorporated beginning from the church for a green revolution in Ghana. He said the Church of Pentecost will partner with government to provide facilities to decongest Ghana's over populated prisons, build CHPS compounds in selected communities and drill boreholes in another partnership with World Vision also in some selected communities across the country. He said God created the earth and handed onto man and demanded care of it from man which must never be overlooked. The Asokwa Municipal Chief Executive, Hon. 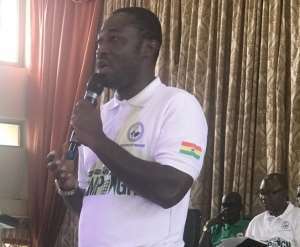 Akwanuassah Gyimah said the government was grateful to the Church of Pentecost for their innovations over the years that has been very helpful to the country and urged them to keep it up. He said the government will continue to support the church and Zoomlion's collaboration to ensure the country becomes attractive to tourists. He warned Ghanaians to be careful of ponzi schemes whereby they follow mouthwatering interest rates to lose their money to such schemes. He explained that it was untrue for people to say that the Finance Minister Hon. Ken Ofori Atta is collapsing banks for his Data Bank to thrive. Hon. Gyimah said it was due to the recklessness in the banking sector that governmendemands the 400 million cedis as protection cover so that when the unfortunate happens and those banks grounds government will use such money to support the depositors. The Asokwa Municipal Manager of Zoomlion Ghana Limited, Mr. Maxwell O. Antwi in a presentation to the congregation said Zoomlion had diagnosed and prescribed the waste bin as a one stop solution to Ghana's waste problems. He said the bin when adopted by everyone including government will provide jobs for the youth, enhance tourism, ensure a cleaner environment, protect Ghanaians from communicable diseases and so, therefore, save the Nationally Health Insurance Scheme (NHIS) from collapsing as fewer people will use the health facilities. He urged government, civil society groups and the individual Ghanaian to embrace Zoomlion's one million bin nationwide distribution project to own a waste bin to ensure household cleanliness. Zoomlion had earlier promised a One Household, One Bin Project which it had assured Ghanaians that Universal Plastic Product and Recycling Plant (UPPR) a subsidiary of Zoomlion had started producing a bin in each three minutes to supply clients nationwide, an initiative Ecobank Ghana had bought into and provided a 10 million dollars loan facility to the company for the project. The Chief of Asokwa, Nana Fe Baamoah who was accompanied by Kaasehene and others was thankful for the partnership between the church and Zoomlion and therefore appealed that Youth Employment Authority should always engage the youth who understand current trends of environmental sanitation to keep the environment clean than the aged who have not enough energy to do the work. He believed Zoomlion's work was commendable in his jurisdiction adding that there is always hope for improvement.